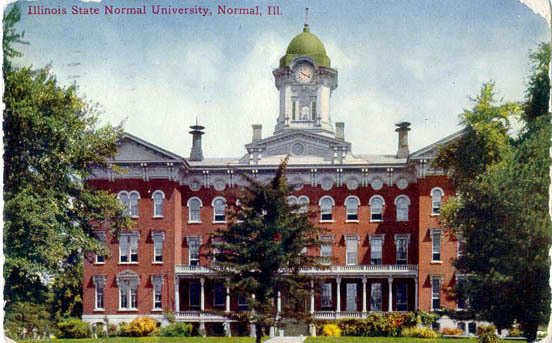 When it was established, it was called Illinois State Normal University. A normal school was a school created to train high school graduates to be teachers. The term “normal school” originated in the early nineteenth century from the French école normale (Edwards 1991: 238). The French concept of an école normale was to provide a model school with model classrooms to model teaching practices to its student teachers (Edwards 1991: 238). The children, the teachers of the children, the student teachers, and the teachers of the students were all together in the same building (Edwards 1991: 238). It was not until 1964 that the name was changed to Illinois State University, in order to reflect its growth into a large liberal arts university with an established College of Business. The University was founded in part by Jesse W. Fell, a prominent Illinois businessman and land owner, who had his friend, Abraham Lincoln, draw up the legal documents to establish the university (Marshall 1956: 24). Charles Hovey assisted in the organization of Illinois State Normal University, teaching the first classes and serving as president from 1857 to 1861. Old Main, south side, post card 1911. The building consisted of a split-level basement and three upper levels. Originally, the basement level contained the janitor’s chambers, including a parlor, kitchen, a cellar and three bedrooms. It also contained a storage room, a laboratory, a chemical lecture room, one playroom for boys and one for girls for the Model school, as well as the boiler and the furnace rooms (Harper 1946:20). Cook (1882:250) wrote, “The part of the basement formerly occupied by the janitor was fitted up for the gentlemen’s dressing room.” An Open House brochure from May 21, 1934, obtained from the University Archive, states that “in the basement are the book store; store rooms and janitors’ rooms; a women’s restroom; and the new Student Lounge, completed just this spring by joint effort of students and faculty. This new lounge is located in the southeast corner of the building in the suite of rooms formerly used as lodging quarters for the janitor.” These seemingly contradictory accounts obfuscate the matter on whether the janitor was living in the basement, and if so, for what length and period during the 70-year span of this investigation. For that reason, this investigation tries to take into account the likelihood of some domestic activities within the Old Main building. Originally, the first story contained administrative offices, as well as the University President’s office, a reception room, a faculty lounge, and storage rooms. In later years, this floor also contained a post office and the telephone operator’s room. 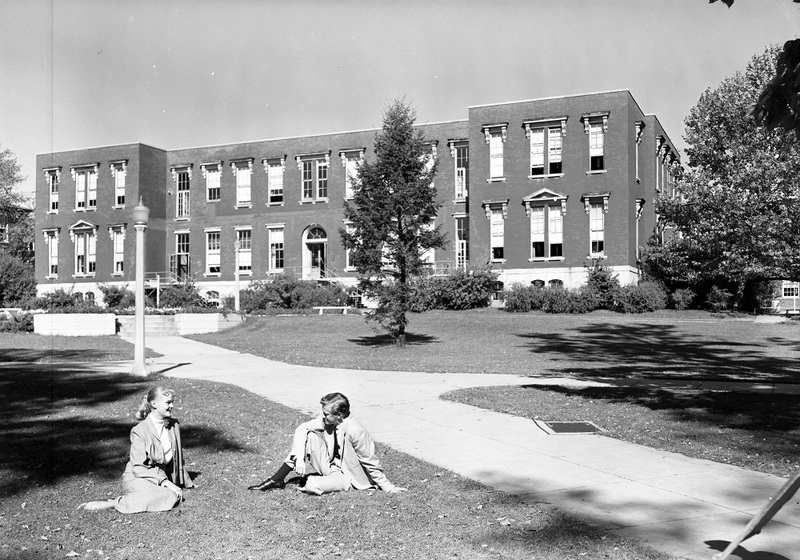 According to Harper (1946), the second story contained the Normal School, including a large assembly room with seating for three hundred people. There were also eight large recitation rooms, and two smaller rooms. The third story contained Normal Hall, with seating for one thousand people. It also housed the Museum of Natural History and the University Library. The Natural History Museum was also the headquarters for the State Natural History Society of Illinois, founded in 1857 (Harper 1946:27). The collections included various specimens collected by John Wesley Powell on his expeditions to the western United States, a few of which are now located in the Felmley Science Building, more are at IWU and even more of the collection is now at the Smithsonian Institution. In 1885 the “surplus specimens were removed to the state house at Springfield and to the University of Illinois at Urbana” (Hasbrouck 1924:193). Enrollment for the Normal School grew each year since its founding, with women often making up the majority of the student body. Hasbrouck (1924: 196) states that “the first year, 1857, recorded an enrollment of 53 men and 74 women and the totals for the next few years ran along this way: 122, 161, 152, 205, 304 and 282. After the close of the Civil War the enrollment mounted above the 400 mark and wavered between 400 and 500 for several years.” In 1907, the attendance had risen to 826, and by 1922 attendance reached 3,749 (Hasbrouck 1924: 196, 198). Old Main building, south side, late 1920s. 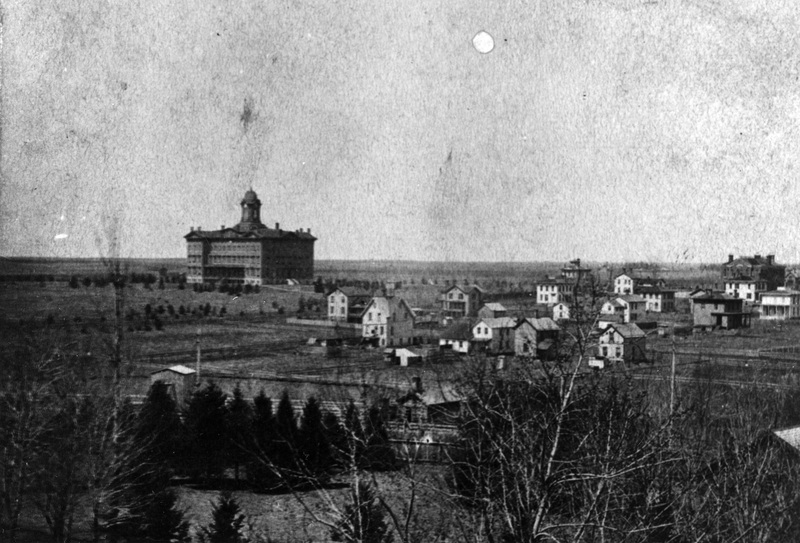 Image courtesy of Illinois State University Archive. Image number ISUAPSC – 8784 – 8 – 1969. In the last years of the nineteenth century, the University sought to expand, “lest the walls of Old Main should burst. Other buildings came to dot the campus, clustering around the original building like chicks about a hen” (Harper 1946:29). According to Plummer (2001:1), in 1892, “North Hall was built for the practice school at a cost of $24,000. It was located immediately north of Main” adjacent to what is now College Avenue. In 1897, “Cook Hall was built as a gymnasium for $76,000. Governor John P. Altgeld, a native of Germany, insisted that all state buildings should be built as castles. It was first known as the gymnasium, then as the “old castle,” and later it was named for John W. Cook, the fourth president of ISNU” (Plummer 2001:1). Gymnasium, Manual Training and Main Building, Normal University, Normal, post card, 1914. 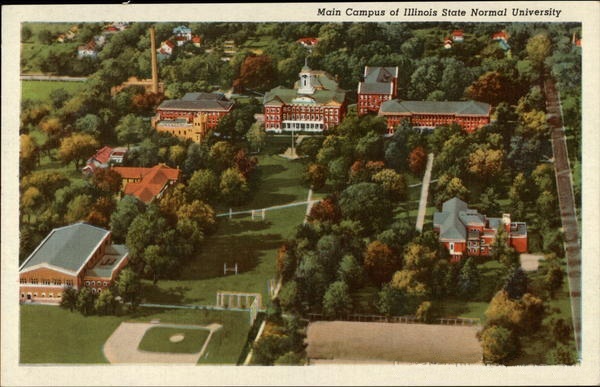 Aerial campus view, Illinois State Normal University, 1930. As the campus expanded, Old Main’s infrastructure was updated. In an early university history, Cook (1882:250) mentions that steam pumps and electricity were already in use, as well as “numerous wash-bowls supplied with water from the cisterns in the roof, and many other conveniences are close at hand.” While Cook states the cisterns were collecting water in the roof, they likely piped water up from the water holding cisterns underground. In 1901, city water was piped into Old Main, but the water collection cisterns were not closed off until 1932 (Proceedings 13 July 1901:9; Proceedings 17 Nov. 1930:11). The archaeological data suggest that during this 30-year span, the subterranean cisterns were used as garbage pits (Barr 1983:72). Many artifacts were deposited into the cisterns, including glass bottles, ceramic dishes, metal hardware, and architectural items (Barr 1983: 72). During the 1920s and through the Great Depression, major structural maintenance for Old Main was limited because of campus expansion (Barr 1983:26). The entrance stairways were replaced in 1932, and pieces of the old iron stairway were recovered from the cistern, suggesting that University employees used the cistern for trash deposition (Barr 1983:75). In 1932, deterioration of the tower became apparent, after it began to lean to one side, so steel pillars were installed to support the tower from the basement to the attic, although this failed to solve the underlying problems (Barr 1983:26). By 1946, the deterioration of the tower had become irreparable, and the tower and top floor were removed, and a new flat roof was placed over the second floor. Old Main’s bell was placed at the north end of the Quad, and it is still there today. As the ISNU campus doubled in size after World War II, maintenance for Old Main was not a high priority. In 1953, the iron stairway to the front entrance collapsed and the wooden porch was falling apart, so they were replaced with a temporary wooden stairway (Barr: 1983:30). 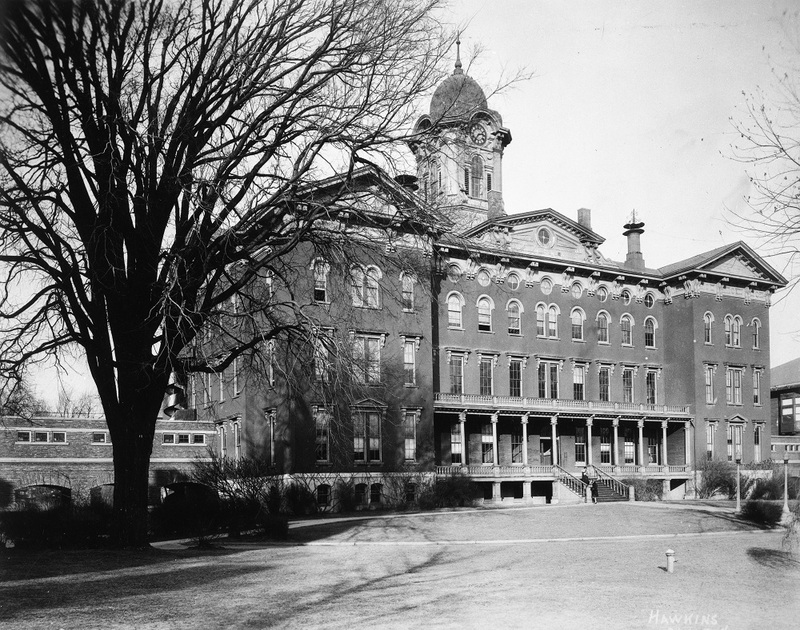 Missing its distinctive porches and bell tower, replaced with a flat roof, and shabby wooden stairs, Old Main lost much of its grandeur. Old Main following the removal of the tower, stairs and porch in 1955. Image courtesy of Illinois State University Archive. Image number ISUAPSC – 888C – 1955. A few years later, University President Dr. Bone researched the restoration of Old Main, but discovered it to be unfeasible because of the advanced deterioration of the wood and brick in the building (Barr 1983:30). 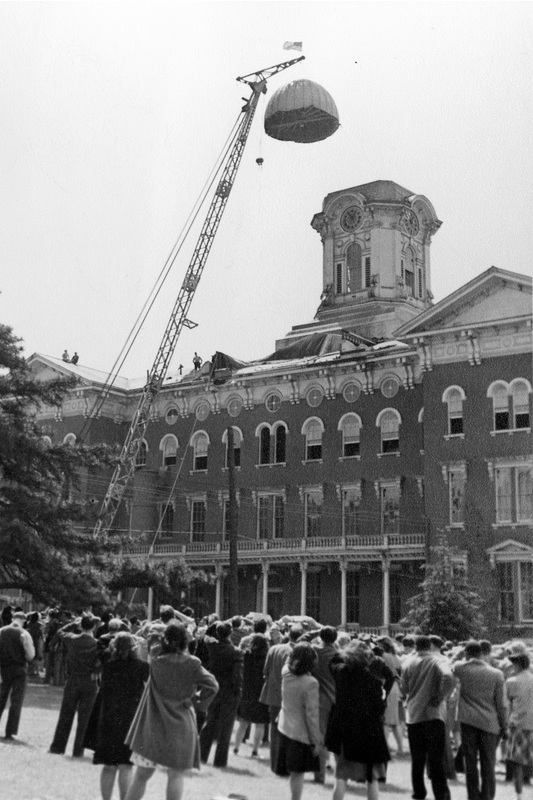 As the Centennial anniversary for the University approached, it was clear the Old Main building was entering its final days. During June and July of 1958, the Old Main building was torn down, and a memorial cenotaph monument was built in its place on the quad. 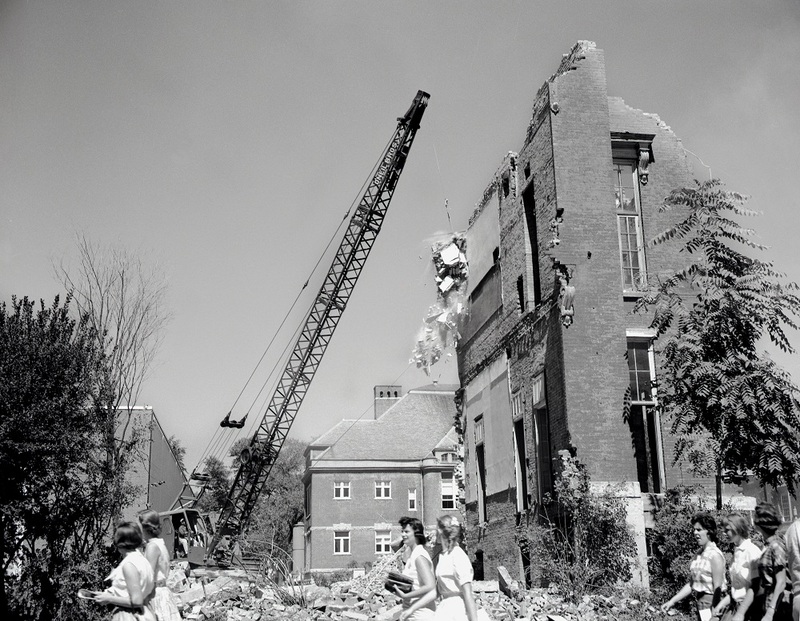 The demolition of Old Main in 1958. Image courtesy of Illinois State University Archive. Image number ISUAPSC – 1603I – 9 – 1958. Over the next 23 years, Old Main drifted out of the minds of the ISNU community. That changed in April of 1981, when utilities workers began to install new electrical lines in the vicinity of the Old Main foundations (Barr 1983:1). The installation process created a trench approximately 10 meters long, which disturbed a brick feature under the sidewalk that connects Edwards Hall with the Old Main cenotaph. This brick feature aroused the curiosity of members of the Midwestern Archaeological Research Center on campus, who obtained permission for an investigation. The electrical work could not be delayed, however, so the investigation of the feature was brief by necessity, lasting less than an hour. Photographs and measurements were taken, and the brickwork was examined. The bricks consisted of “hand molded, soft mud, “slot bricks” used in the nineteenth century for the foundations and inside jobs that would not show” and were set in the common bond pattern (Barr 1983: 2). The brick feature was determined to be the edge of the west water-filtering cistern that had been beneath the stairway to the west entrance of Old Main (Barr 1983: 2, 4). 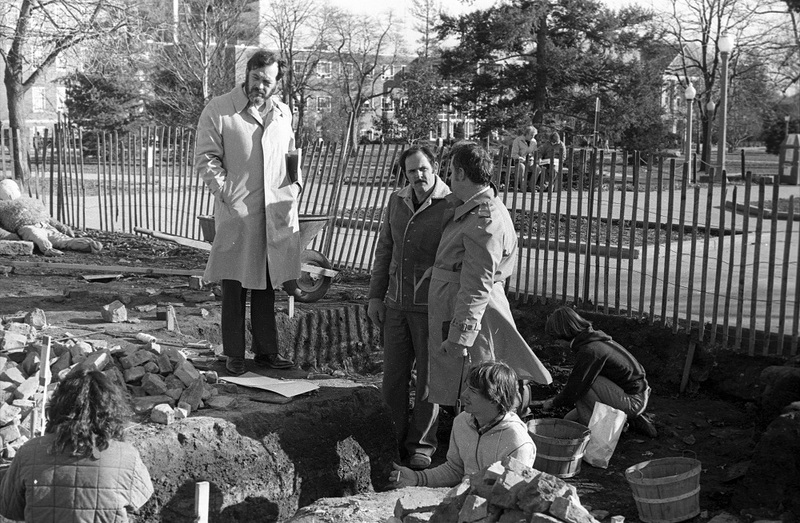 1981 Old Main excavation led by Keith Barr, standing center. Image courtesy of Illinois State University Archive. Image number P121A. The Old Main artifacts were identified, quantified, and briefly analyzed before entering storage, first at the University, and then at the Illinois State Museum Research and Collection Center in Springfield, IL. Using other datable artifacts including ceramics, Barr determined that majority of the artifacts were made before or during 1920 (Barr 1983: 74). 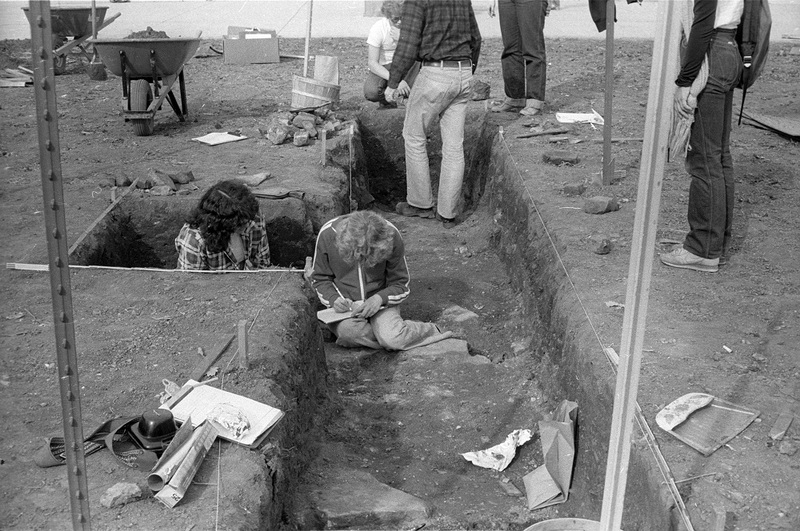 The Old Main archaeological exploration results were published by Keith Barr as his Master’s thesis in 1983. 1983 The Old Main Site: Archaeological Explorations of the Illinois State Normal University Building. Master’s thesis, Department of Anthropology and Sociology, Illinois State University, Normal, Illinois. 1882 A History of Illinois State Normal University, Normal, Illinois. Pantagraph Printing and Binding Company, Bloomington, Illinois. 1935 Development of the Teachers College in the United States, with Special Reference to the Illinois State Normal University. McKnight & McKnight, Bloomington, Illinois. 1946 Old Main. Illinois State University Bulletin 52 (2). 1924 History of McLean County, Illinois. Historical Publishing Company, Indianapolis, Indiana. 1956 Grandest of Enterprises. Lakeside Press, Chicago. 1967 The Eleventh Decade. Pantagraph printing, Bloomington, Illinois. Proceedings of the Board of Education of the State of Illinois. 1857-1917. Continued as Proceedings of the Normal School Board 1917-1941, and as Proceedings of the Teacher’s College Board 1941-1958.